ADATA likes to produce a broad range of SSDs, sampling from all the controller and NAND manufacturers. To that end, they have wholeheartedly embraced the use of 3D MLC NAND even as most brands are using the 3D NAND transition to entirely remove MLC from their consumer product lines or relegate it to niche models instead of treating it as the mainstream default. ADATA is selling multiple SATA and NVMe models using Micron's first-generation 3D MLC NAND. On the SATA side of things, they have the Ultimate SU900 and XPG SX950 as the MLC models (positioned above the SU800 and SU700 using 3D TLC). For the NVMe market, they have the XPG SX8000 and XPG SX9000 pairing 3D MLC with Silicon Motion and Marvell controllers respectively. So far, all of their 3D NAND SSDs have relied on Micron's first-generation 32-layer 3D NAND, the only 3D NAND available in volume on the open market. 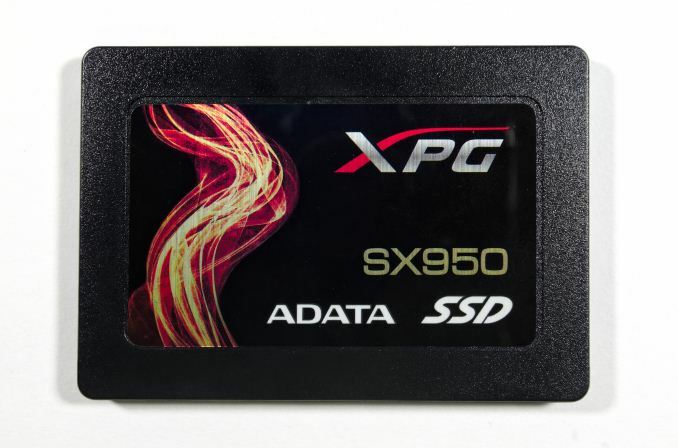 The ADATA XPG SX950 is their top of the line SATA SSD. Technologically, it is very similar to their Ultimate SU900: both use the same Micron 3D MLC NAND and Silicon Motion SM2258 controller. The SX950 is distinguished by reserving more spare area (yielding usable capacities like 480GB instead of 512GB) and a six-year warranty instead of five. There may be significant firmware tuning differences, but there are no obvious signs such as one model providing TCG Opal encryption support (both lack that feature). ADATA did their own NAND packaging for the SX950, so it may be using flash binned for better endurance. The SU900 has a 2TB model listed but not yet available, while the SX950 line only goes up to 960GB, with limited availability of the largest model. The construction of the ADATA XPG SX950 is similar to ADATA's other recent SATA SSDs: a metal base and plastic lid are joined by a single screw through the center of the drive. The PCB occupies only half of the case, and has pads for eight NAND packages and two DRAM packages. On our 480GB sample, all eight NAND pads are occupied with dual-die packages, for a total raw capacity of 512GB. Micron recently re-introduced MLC NAND to their consumer product line with the Crucial BX300, using their 32L 3D MLC and the SM2258 controller. The Crucial BX300 is positioned as more of an entry-level model, with a focus on lower capacities that cannot perform well when using their 3D TLC. The ADATA SX950 has twice the warranty period and up to five times the rated write endurance, but any performance differences will come down to firmware tweaks, and ADATA hasn't updated the firmware since the SX950 launched earlier this year. Current pricing for the SX950 shows that ADATA has not responded to the introduction of the BX300: for the two capacities where the models match up, the ADATA is more expensive by 25% and 45%. That's quite a premium for a longer warranty. Moot point, as I don't identify with the human herd. Cattle mentality and the accompanying irrational behavioral patterns don't sit well with me. Which is also why I refer to humans in third person, a subtle nuance an intelligent person would have read into. But not you though, you perfectly fit the profile, seeing how once again you fail at getting stuff or making sense ;) But still, an understandable effort, you are probably still hurting by that chain of pwnage. And it's only parroting cliches because you really cannot do better. This quote "Sadly, very little of what humans do is because it is necessary or it makes sense," is a telling feature reveal of this AI Cyborg miscreant, who apparently has a deep rooted need for focusing on humans, describing humans, engaging humans, belittling humans; and it's apparent its existence and glorified self aggrandizement is defined solely on the existence lowly humans, as evidenced by the closing statement "you are not the intended audience ...".